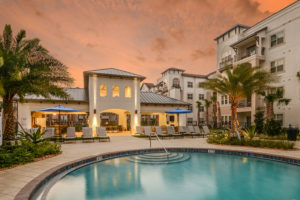 Miami and Orlando, Fla. – The Kislak Organization, Courtelis Company and HMG/Courtland Properties – all based in Miami – announce the sale of Murano Apartments in Orlando. The trio of real estate powerhouses broke ground on the project in May 2015, began leasing in summer 2016, and the chic, luxury property was more than 95 percent occupied when sold this week to Murano 240, LLC, a Grant Cardone entity. Murano Apartments, a 240-unit luxury apartment home community in Orlando, has sold. Principals for the sellers, who developed Murano Apartments, were Thomas Bartelmo, president and CEO, for Kislak; Elias Vassilaros, president, development and asset management services, for Courtelis; and Maurice Wiener, chairman of the board of directors, president and CEO of HMG/Courtland Properties. Robert Given, Jay Ballard, Ken Delvillar and their Cushman & Wakefield team represented the sellers. A best-in-class garden-style community, the 240 unit Murano Apartments is located on a 9.53 acre site at the southeast corner of John Young Parkway and Taft Vineland Road in metro Orlando. Its three four story buildings feature one-, two- and three bedroom floor plans and an array of high-tech, high-style and high-convenience amenities. Murano was designed by Forum Architecture and Interior Design of Orlando, Roger B. Kennedy, Inc., was the general contractor, and Wells Fargo provided construction financing. Cottonwood Residential was engaged to oversee property management, marketing and leasing. Established in 1906, the privately held Kislak Organization is based in Miami, Florida. Its primary lines of business are multifamily property ownership and management, multifamily and commercial real estate brokerage in the Northeast, and tax certificate investment funds. The organization invests and operates nationwide on behalf of the Kislak family and its partners. Courtelis Company was founded in 1963 and is headquartered in Miami, Florida. It offers full-service real estate development and asset management services, including site selection, master planning, commercial and residential development, leasing, property management, construction and disposition. The company is involved in projects throughout Florida. Founded in 1971, HMG/Courtland Properties, Inc., is based in Miami, Florida. The company, along with its subsidiaries, has owned and developed a variety of commercial real estate properties, including hotels, recreational clubs, retail stores and yacht slips.